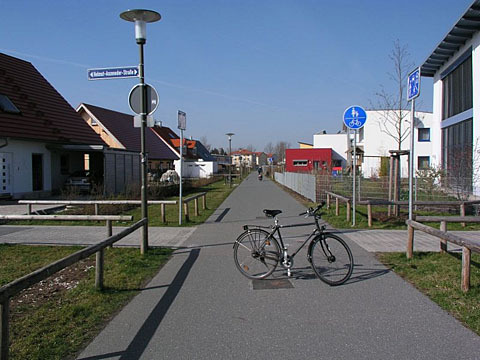 Thanks to Ulrich Nehls, Carfree Times has been available in German since September 2003. The German edition is available about a month after the English edition and linked from it, near the top, when the translation is ready. The new book is finally in a full first draft. The first three Parts are in final form, but the troublesome Part IV will require another couple of months to beat into shape. I'm now hard at work on it. Both the paperback and hardcover editions of Carfree Cities are widely available. For details, see the Ordering Information page. Two anonymous donors paid for hosting in April and May 2007. Bernard Delloye paid for June 2007. Earth's General Store (Edmonton) paid for July and August 2007. Trevor Smith and Shelley Marie Webb paid for September 2007. Ed Beale is keeping us going in October, November & December 2007. Dr. Irving Rudman paid for January 2008. Thanks to all our contributors for their generosity. Please see the Support Page if you can consider making a contribution. Thanks to the many stringers who have forwarded stories to Carfree Times. I've stopped naming people for fear of slighting someone by overlooking a name, but stringers now account for about half of the News Bits in an issue. Carfree.com supports World Carfree Network (WCN) in part by posting the most important network announcements here. Visit the WCN web site for full information regarding the network's activities and for membership information. Towards Carfree Cities VII will be held in Istanbul, August 27-31. With the theme "Building a Livable Future in a Changing Climate," this year's conference will be held at Istanbul's Mimar Sinan University of Fine Arts. Proposals for presentations, workshops and other programme content are still being accepted. See www.worldcarfree.net/conference/proposals.php for details; please send proposals as soon as possible. Conference registration is open, and participants should book their accommodation now. An update to the conference website www.worldcarfree.net/conference/ will be available soon. Portland, Oregon, will host the 2008 conference, which is shaping up nicely. Sketchy information is available on the same page as just above. 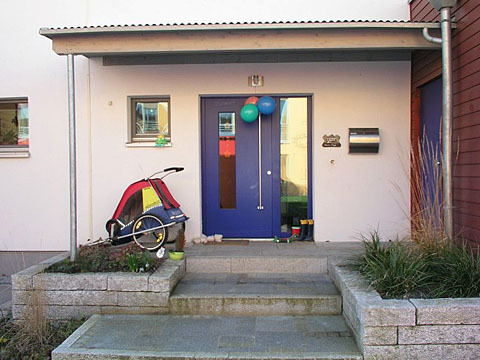 By popular demand, the Street Conversion Design Contest returns in 2007. The contest aims to promote alternative, creative uses of public space. Once again there are three submission categories: parking areas, block-long street segments, and intersections with their adjoining streets. The contest is open to anyone. Details and guidelines will be posted at www.worldcarfree.net/contest/ on 11 May 2007. The deadline for submissions is 15 August 2007, and judging will take place at the Towards Carfree Cities VII conference. Support WCN: become an individual member at one of four levels, starting at €15 per year. All membership levels include a subscription to Carbusters, and most include other premiums as well. The network sponsors many projects in which you can get involved, ranging from the annual Ecotopia Biketour to the Carfree Area Pilot Project. See the list of projects at and contact one of the project coordinators. The network is always seeking motivated young people (EU citizens aged 18-25) to join the network's Prague-based team for a year's internship. The UK architecture firm of Foster + Partners has announced that the walled city of Masdar in Abu Dhabi, being designed by the firm, will be the world's first zero-carbon, zero-waste city. 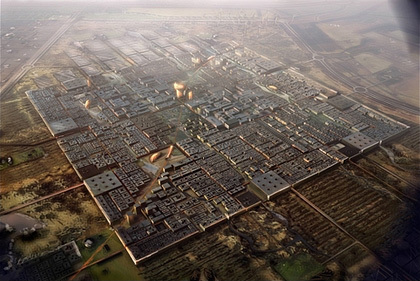 Masdar is a 6 sq-km (1500 acre) carfree walled city. Abu Dhabi’s Future Energy Company is the project sponsor and will locate its headquarters in the city, which will also include a new university, special economic zones, and an Innovation Center. Norman Foster said, "The environmental ambitions of the Masdar Initiative - zero carbon and waste free - are a world first. They have provided us with a challenging design brief that promises to question conventional urban wisdom at a fundamental level. Masdar promises to set new benchmarks for the sustainable city of the future." The plans were unveiled 8 May 2007 at the Cityscape conference in Abu Dhabi. 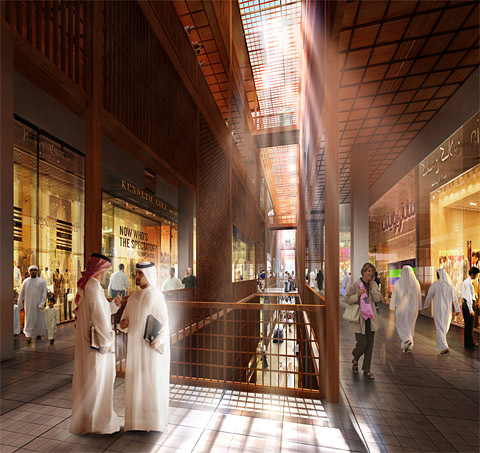 Masdar will be a dense, walled development built in two phases. Wind parks, photovoltaic farms, research fields, and plantations will be sited outside the walls, enabling the city to be fully self-sustaining, according to Foster. The development is set to open in late 2009. Most interestingly, the project will be based on the traditional planning principles of walled cities, united with new technologies, to achieve the sustainability target. The city will be linked by a network of existing road and new rail and public transport routes to surrounding communities, the center of Abu Dhabi, and the international airport. The maximum distance to public transport will be 200 meters (about 220 yards), and a compact network of streets will encourages walking. A personal rapid transport system will be constructed. Shaded walkways and narrow streets are expected to create a pedestrian-friendly environment, no mean feat in Abu Dhabi's scorching climate. "Images: Foster unveils green utopia in the desert"
"World's first zero carbon, zero waste city in Abu Dhabi"
Biofuels have yet to be proven viable, and mechanization may not be a great strategy in a world of declining energy.
. . . only a small amount of biomass [is] unspoken for. As prices of fertilizer inexorably rise due to natural gas depletion, it will be cheaper to return residues to the soil than to buy fertilizer. It's time to start increasing horse and oxen numbers, which will leave even less biomass for biorefineries. A few more points are summarized or quoted here. Agri-biz giant ADM makes a fortune from ethanol production, but the business depends on massive subsidies to prosper. Does the business model still work without subsidies? Probably not. The Department of Energy hopes to replace 30% of petroleum consumption with bio-fuels by 2030, so the question is of great importance. Biomass fuels have obvious and predictable reasons for failure. Odum says that time explains why renewable energy provides such low energy yields compared to non-renewable fossil fuels. The more work left to nature, the higher the energy yield, but the longer the time required. Although coal and oil took millions of years to form into dense, concentrated solar power, all we had to do was extract and transport them. Every processing step needed has associated energy costs, reducing the net yield of the process. Bio-fuels are processing intensive. Fertile soil will be destroyed if crops and other wastes are removed to make cellulosic ethanol. We stand, in most places on earth, only six inches from desolation, for that is the thickness of the topsoil layer upon which the entire life of the planet depends. Fuels from biomass are not sustainable, are ecologically destructive, have a net energy loss, and there isn't enough biomass in America to make significant amounts of energy because essential inputs like water, land, fossil fuels, and phosphate ores are limited. The "net energy loss" part is the clincher. I hope that "bio-fuels" will prove to be an even shorter-lived fad than the "hydrogen economy" (have you noticed how that's dropped out of the limelight?). Pretty soon, we might find ourselves dealing with unvarnished reality. This will be difficult, but carfree cities offer a very palatable solution. and are a Threat to America's National Security"
City planners can and must do a better job at approximating the community life of old, in which everyone knew every child's name and home address. . . . Older neighborhoods in cities like Chicago, New York, London, and Paris do produce such social capital, but only because they were designed for people to live, work, do their shopping, and go to school in. . . . We can design our life any way we want, but whether we will thrive depends on how well the life fits human predispositions. Is 50,000 Critical Mass Yet? Budapest astounded cycling advocates a year ago when 25,000 turned out for a Critical Mass ride, overwhelming by an order of magnitude the largest previous ride anywhere. Not to be outdone, this year some 50,000 cyclists participated in the Critical Mass demonstration in Budapest. They were joined by the president of Hungary and the mayor of Budapest. This was the first Critical Mass in Budapest that did not draw negative comments from the media. A pro-car demonstration, following the same route, drew 7 participants. Pretty soon, somebody somewhere is going to start taking cycling seriously. András Lukács and Justin Hyatt contributed to this article. Congestion Charging in New York? New York mayor Bloomberg, not a noted friend of pedestrians or bicyclists, is, to my great surprise, proposing a peak-hour congestion charge for cars and trucks entering Manhattan, not unlike the highly successful example in London. The Republican mayor said, "Let’s face up to the fact that our population growth is putting our city on a collision course with the environment, which itself is growing more unstable and uncertain." One major objective is to reduce greenhouse gas emissions by 30% by 2030, by which time another million people are expected to live in the city. An $8 fee would be imposed on car drivers, and $21 on trucks, to drive in Manhattan south of 86th Street. The fee would only be imposed on weekdays between 06:00 and 18:00. Motorists driving on major highways along Manhattan’s east and west shores would not be charged. Transit service improvements are to be implemented before the scheme comes into operation. "We’re not interested in preaching to others," the mayor said. "We’re doing what’s best for our city. And when we reap the benefits, perhaps others will continue to follow." Bloomberg, it should be noted, takes the subway to work most days. "Mayor Proposes a Fee for Driving Into Manhattan"
"Bloomberg unveils congestion pricing plan"
Röthelheimpark: You may drive a car here - but you won't, unless really necessary! Dutch traffic experts have announced that there is no hope for traffic jams. The massive traffic jams that occur in most of the country cannot be relieved by traffic management or road construction. Even a per-kilometer charge for driving will not reduce the problem. This is a real political football in the Netherlands, especially given that the previous government had promised to reduce the length of jams by a third. In fact, they increased by a quarter. Facts notwithstanding, the Christian Democrat minister of traffic, still expects to reduce congestion by 40% in the year 2020 compared with 2000. The minister hopes that a combination of measures, including new roads, better use of existing roads, and a per-kilometer charge can achieve this result. The experts, however, say the problem is impossible to solve because more total distance is being driven every year. Between 1990 and 2005, total kilometers increased by 26%. Experts say that any reduction in congestion would be immediately absorbed by new traffic. A per-kilometer charge will probably be inaugurated in 2011, but the expectation is only that it would slightly retard the rate of growth in driving. The country, once noted for the Swiss-like quality of its rail system, now seems to be unable to get the trains to run on time despite 15 years of massive investment in rail infrastructure. Only 5% of trips are taken by public transport, compared to 62% by car. I should note that during the 14 years I lived in Amsterdam, I never drove a car and never felt the need for one. I think what happened is that the Dutch took over the American happy-motoring model, lock, stock, and barrel. It didn't work in the USA and it isn't working for the Dutch, either. It's too bad they could not learn from the American failure, in this as in so many other things. "Verkeerskundigen: files niet op te lossen"
City Cargo in Amsterdam says that its freight trams could reduce heavy truck traffic in the inner city by half. This would require that the loads of 2500 trucks a day be carried by tram. Only construction materials pose a problem. The empty trams could even carry waste out of the city. The company had ordinary passenger trams rebuilt as freight trams, which actually required little work. A single freight tram can carry the load of four medium-sized trucks. Stores may benefit, as they could receive goods throughout the day, rather than just in the narrow morning window during which truck deliveries are now allowed. During a recent test, the trams were loaded at the end halt of one of the major tram lines. Freight trams run between 07:00 and 23:00 along existing track to two unloading spots where the trams can be shunted onto sidings. There the goods are loaded onto small electric trucks for final delivery. If the plan is introduced, air quality targets for the period 2007-2011 might actually be reached. One other important effect would be a significant reduction in deadly truck-bicycle collisions. "Confidence in feasibility cargo tram"
"Cargo tram 'a bit madness'"
San Francisco Mayor Gavin Newsom has directed the municipal transit agency that runs the city's cable cars, buses, and streetcars to consider eliminating all fares. This would apparently be the largest free-fare experiment in the USA. The mayor hopes that free transit will lure people out of their cars and reduce traffic. No US city now has a system-wide free-fare policy, but more than a dozen large cities have no transit fares within their downtown areas. The mayor said that the no-fare policy may not be a large financial burden on the city, when the total cost of collecting fares is taken into consideration. This year's project fare-box revenue is just $138 million, a paltry 22% of the agency's annual budget. A fare-free system would operate considerably faster, saving riders' time and reducing operating costs. If the idea is adopted, it will probably begin as a pilot project on just a few lines or certain days. Newsom says he expects report in about a month"
Toronto's public-transit agency has proposed a $6-billion, 120-kilometer (75 mile) light-rail network that would link the city's suburbs to each other and downtown over the next 15 years. Almost 70 million new annual riders are anticipated, and Toronto would, in this vision, be transformed into a transit city. Seven new light-rail lines would be constructed in reserved lanes along major avenues. If funding is approved, the plan would bring rapid transit to the suburbs. Downtown Toronto already has an excellent, if small, metro network. Similar levels of service are needed in the suburbs. Street-running light-rail vehicles, or streetcars, in their own dedicated lanes, are relatively common in Europe but have been controversial in Toronto. Plans for tracks in dedicated lanes on St. Clair Avenue – now under construction – were mired in a long battle with residents and business interests who opposed them on the grounds that they would cause traffic chaos and reduce parking. "$6-billion light-rail network to transform Toronto"
From 16 to 22 September 2007, European citizens will enjoy a week of events dedicated to sustainable mobility. The objective is to foster debate on the necessity for changes in transport behavior, especially use of private cars. The Carfree Day will be, as usual, the highlight of the week. This is the sixth edition of European Mobility Week. This year's theme is "Streets for People," which is intended to make clear that increasing road space for cars is no solution to transport challenges. Reducing road capacity for cars is a sustainable solution that also improves health for all citizens without reducing mobility. Local governments are encouraged to reallocate some road space to non-motorized traffic. Many Europeans are concerned about the poor quality of their air. Most favor increasing the amount of greenway and pedestrian area in order to rebuild local communities while solving air quality and noise pollution problems. As is now well known, capacity reductions for road transport do not actually increase traffic congestion. Instead, traffic simply "evaporates." Wal-Mart is on a green offensive, and several major environmental groups that should know better, such as NRDC and EDF, have endorsed its initiatives. It's true that some of the initiatives are substantial. One is a promise to make its stores 20% more energy efficient by 2013. Another is a plan to double the fuel economy of its truck fleet by 2015 (which I doubt can be achieved; a shift to rail might do the trick). The company has estimated that its US operations released 15.3 million metric tons of CO2 in 2005, most of it from generation of electricity used by the stores. This cannot be dismissed as greenwashing. It's actually far more dangerous than that. Wal-Mart's initiatives have just enough meat to have distracted much of the environmental movement, along with most journalists and many ordinary people, from the fundamental fact that, as a system of distributing goods to people, big-box retailing is as intrinsically unsustainable as clear-cut logging is as a method of harvesting trees. The real problem is that its basic business model requires enormous stores that serve huge catchment areas, with many people driving long distances to reach the stores and their everyday low prices. That, of course, releases far more CO2 than bringing the goods to small stores much closer to the average customer. Wal-Mart isn't doing anything about this part of the problem because the only way to solve it is for them to go out of business. US mileage for shopping trips rose by more than 40% between 1990 and 2001. And it's not more trips, it's longer trips. Big-box retail is directly to blame, because it has killed tens of thousands of local businesses. 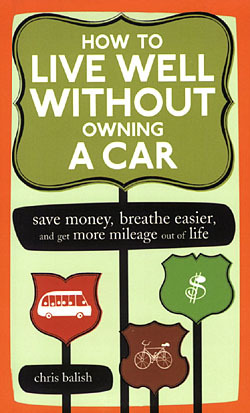 In 2001, Americans drove over 330 billion miles to and from stores, releasing more than 140 million metric tons of CO2. Wal-Mart accounts for 10% of US retail sales, so the company's share of these emissions is, by 2007, over 15 million metric tons. This is the elephant in the bedroom. No matter what else Wal-Mart may do, they can't exert any real effect on total CO2 emissions except by shrinking their operations. Even a major improvement in car fuel efficiency cannot reverse the rapidly rising annual shopping mileage. Wal-Mart continues to build, consuming land, inducing more driving, and wrecking local businesses close to customers. Don't be fooled by the green window dressing. 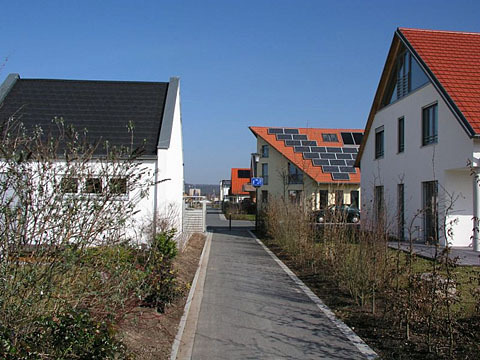 The impossibility of a green Wal-Mart"
Erlangen, one of the old German university towns, is located in northern Bavaria, 20 km (12 miles) north of Nuremberg. Among its historical influences there is a longer period of Prussian rule (during which the university was founded in 1743), and, as a result of that, a strong French influence. The Edict of Potsdam (1685) caused many French protestants, the so called "Huguenots," to leave their country and emigrate to Prussian territory. French immigrants have largely shaped Erlangen since then. After the second world war Erlangen grew rapidly since the Siemens Company relocated large parts of its production and research from Berlin to Erlangen and Munich. As a consequence car traffic rose significantly. During the '70s and '80s the Social Democratic mayor of Erlangen applied a pro-bicycle policy, making Erlangen one of the best-known bicycle-cities in Germany. Among 100,000 inhabitants, more than 20,000 students make up a large proportion of cyclists. The old town market place, a single large parking lot until then, was made a pedestrian zone. Today there are only market stands on the market place, serving pedestrian customers during working days. Also the market place was crossed by a north-south main road in the '60s. But cars were banned after a four-lane highway was built west of Erlangen; today the former main road is fully pedestrianized. 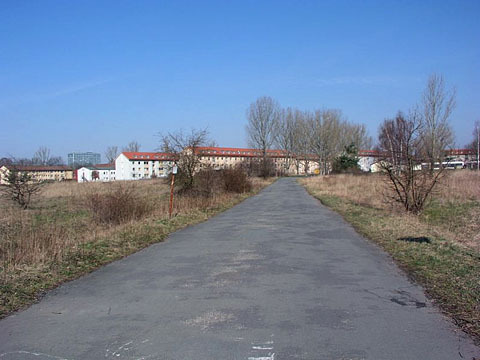 Until 1994 Erlangen was a location of the US army, which occupied a large strip in the east of the city. When the army moved out a broad discussion started about how to use the free space. Ultimately, large parts of it were given to Erlangen's most important employers, Siemens and the university, along with other businesses. A new residential area was planned close to the former housing area for Army employees. The area is still under construction, but many houses have already been completed. It is a mixed environment, intended to provide affordable living for young families in town houses, as well as expensive single-family houses adjoining the environmentally protected southern area. Most movement is non-motorized; the streets and paths are populated by many children. Bicycle trailers are widely used instead of cars. 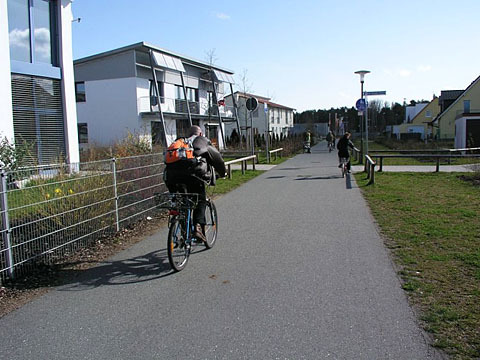 There is a large shopping center on the northern edge of the district which is reachable by bike within minutes. Some residents say their car often stands unused for weeks. 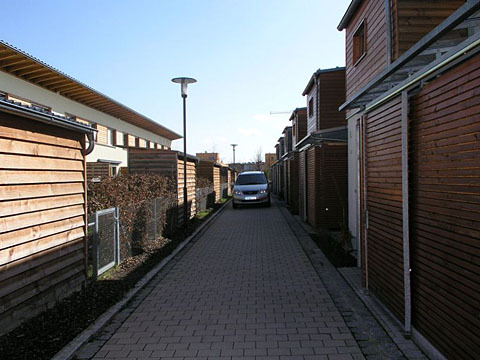 Nevertheless many of them seem not to care about the high costs of owning a car (even an idle one), which shows that Röthelheimpark is generally a place of medium- and higher-wage families. Many people do seem to be interested in car sharing/pooling, however. 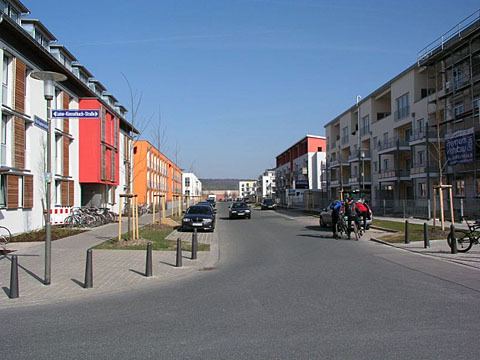 The new residential area was not planned from the start as a carfree district. If this had been the case, then there would almost certainly have been opposition from the beginning, as has been the case with other German cities. 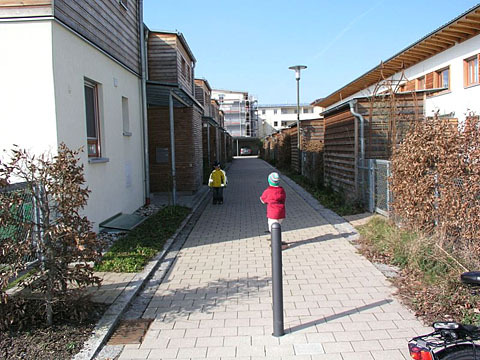 As a high density built environment most streets in Röthelheimpark are much narrower than usual, allowing cars to pass through but not to be parked since they would hinder any other vehicle (including ambulances and fire trucks). 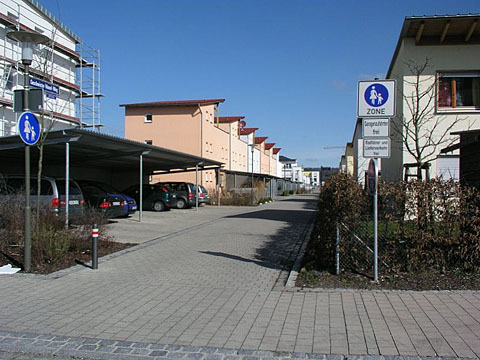 Multi-story parking lots were built in the corners, and purchase of a parking space was made obligatory for every home owner except those with their own carport beside their house. 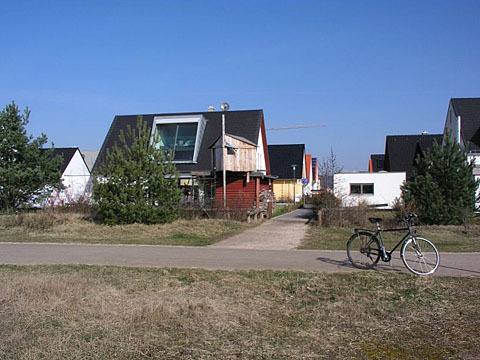 Röthelheimpark is widely regarded as a first-class living environment by its inhabitants. Beside the quiet and slow-paced environment, the large green strip in the middle of the area is a highly prized gem in the eyes of the residents. However there still are a couple of problems. There are almost no public buildings, social, cultural, shopping, or recreational facilities in the area. 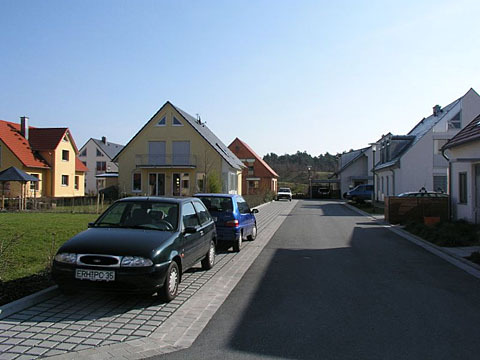 Thus residents tend to use their cars in order to reach those outside the district. The most serious problem enunciated by home owners - the lack of parking spaces - seems unreasonable in the face of many unoccupied/unsold parking spaces. But Röthelheimpark is regularly flooded by cars from Siemens employees during working hours, many of whom are commuters from the suburbs. 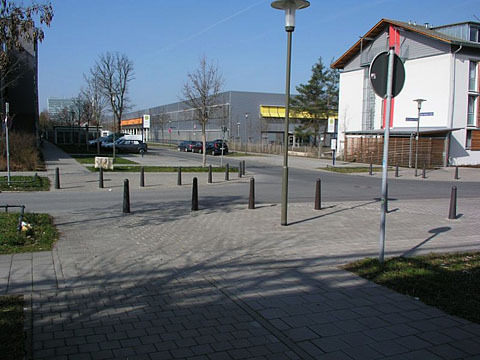 One major crossing in the area had to be protected by bollards to keep cars from parking illegally. Since cars are not completely banned, accidents have occurred within the area. Two girls were struck by a Mercedes driver in December 2006. Maybe the narrow streets, which encourage families to allow their children to play outside without supervision, give a false sense of security. Indeed, cars have to move slowly inside the area, and traffic volumes are low. But cars remain a problem. On the other hand, a carfree residential estate would not have been accepted by prospective house buyers. The times unfortunately are not (yet) that way. Until now the "stealth" approach seems to have worked the best - allow people to keep their cars when a new site is developed but build it so densely that cars can't really make inroads. Once new car-sharing businesses are established in the district, the overall number of cars might decline significantly. 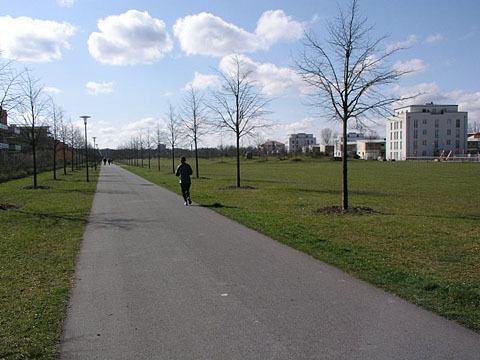 But even the current situation in Röthelheimpark would hopefully become a well-known example for a better life with fewer cars. In an excellent interview the author Richard Louv points out that in the developed world children live in a bubble that is slowly disconnecting them from nature. In his recent book, Last Child in the Woods: Saving Our Children from Nature-Deficit Disorder, he coined the term "Nature-Deficit Disorder." Several research studies around the world have shown that the lack of meaningful connection with natural areas leaves children spiritually and emotionally impoverished and ill-equipped to face their adult lives. In a study financed by the Swiss National Science Foundation (Schweizerischen Nationalfonds) and by the city of Zürich, Marco Hüttenmoser studied families using both qualitative and quantitative methods. One of the results: children who can not go outside to play without accompaniment already show at the age of five major deficits with regard to their motor and social skills. This is mostly due to the dangers of car-traffic and lack of suitable play environments near their home. In a further study Hüttenmoser compared drawings made by children who walked to school with drawings from children who were driven to school by car. When asked to draw their journey to school, children showed very different patterns according to their method of transport. 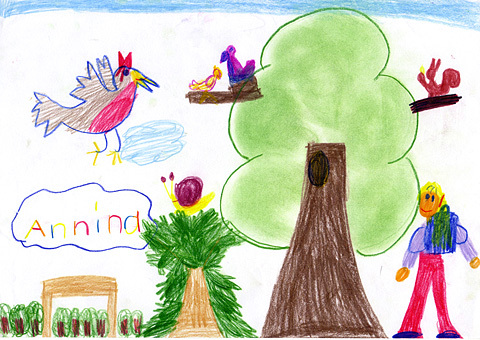 Children who walk to school draw a rich path with many details of nature, animals, and other people. 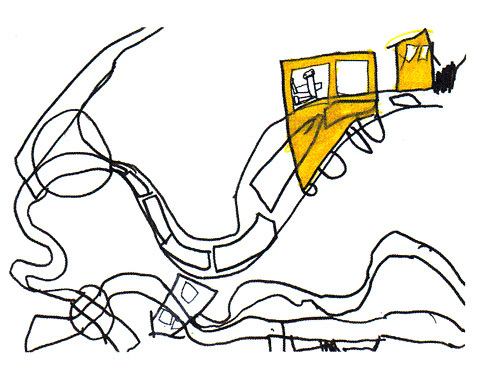 Children who are driven to school draw the route, consisting of, at best, a road, a few cars, the school house, and home. Cars not only have a direct impact on children - putting them in danger - but also an indirect impact - changing the streets where they play and depriving them of nature and social interaction. In a more recent project entitled "The contribution of good public spaces to social integration in urban neighbourhoods" Daniel Sauter and Marco Hüttenmoser studied - once again under the auspices of the Swiss National Science Foundation's "social inclusion and social exclusion" program - the effects of traffic on the social relations of residents living on streets with different traffic volumes and speeds in the city of Basel. The results substantially confirmed the findings of the famous study by Appleyard and Lintel more then 30 years ago: residents who live on traffic-calmed streets have considerably more contacts and more intense social relationships with their neighbors. Moreover, those who live on streets with fewer and slower cars feel safer and use public space more often - only 24% of residents living in 50 km/hr streets claimed to linger occasionally in the street, 37% in 30 km/hr streets reported doing so, and 51% in strolling zones (shared-space with priority to pedestrians and a maximum speed of 20 km/hr). Children who are allowed to be outdoors on their own stay there considerably longer than other children. In summary: traffic and the quality of the street environment have a substantial influence on the social life of neighborhoods, the use of public space and the personal feeling of being socially integrated. The results of the study show a fascinating spectrum of street life and interactions in the different settings and provide additional arguments for creating walking-friendly, livable street environments. Download an English summary of the study by Sauter and Hüttenmoser. (Alternate download.) A more detailed account of the research will be published in September 2007. See also an article by Richard Louv in the March/April 2007 issue of Orion: "Leave No Child Inside: The growing movement to reconnect children and nature." This book explains how cities actually work. It will serve as a guide and inspiration for planners to re-humanize our cities using the latest technologies and recent understanding from science and mathematics. The dogma of mainstream urbanism cannot cope with the changes in technology, culture and science of the last decades. The heritage we are left with is an overly asphalted and sterile concrete environment. Therefore this book addresses the needs of professional urbanists, students and teachers, who wish to understand how and why cities are successful or not, depending on their form, components, and substructure. Most of the needs are related to the urgent search for new instruments of urban planning and design, to which this book contributes conceptually by showing how to connect the fractal city on multiple levels. There is an increasing awareness that a city needs to be understood as a complex interacting system. Different types of urban systems overlap to build up urban complexity in a living city. This raises the need for using concepts such as coherence, emergence, information, self-organization and adaptivity. This book relates these concepts to the city, shows how to operationalize them, and hopefully marks the beginnings of an urban science. Between rising gas prices, endless car payments, and countless hours spent in gridlocked traffic, do you ever get the feeling that you don’t own your car, but rather your car owns you? Car-free convert Chris Balish shows why kicking car dependency could be the soundest and sanest lifestyle change you can make, and provides realistic strategies for making the leap. From saving money to building a better world, even diehard autoholics will find hundreds of reasons to set out on the (car-free) road less traveled. Healthy Cities looks at the design of communities in the United States as mandated by law and how that design affects the delivery and cost of health care. This book recommends modifications to reduce health care costs, assure an adequate health infrastructure, and increase disease and trauma prevention through improved urban planning mechanisms. 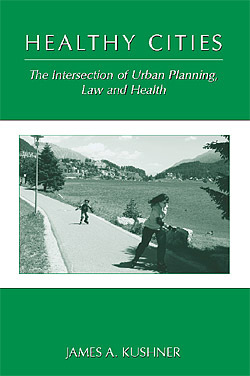 Healthy Cities is the first book in the fields of public health and urban planning to explore legal mechanisms to integrate health and urban design policy. American urban design contributes to obesity, air pollution, and traffic congestion. Imagine if our communities were designed for health, fitness, and convenience. 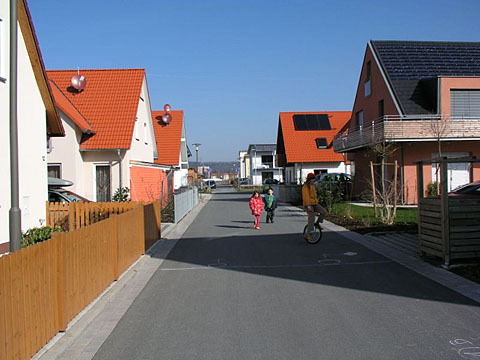 Can housing and neighborhoods be designed for pleasant walks and car-free living? Can streets be tree-lined and attractive? Can pedestrians enjoy their surroundings and experience rather than being sandwiched between traffic and parking lots? As the population ages and medical services extend longevity, how should communities be planned to extend access to health services and ensure the healthiest environment for the population? The U.S. population of those older than 65 will double by the year 2020. How should residential living be structured to meet our population’s various needs - from those of children, to adults needing high-level care, to those who are disabled? How can communities be designed to provide the greatest autonomy, freedom, and happiness for their populations? The Production of Sustainable Urban Space: A Comparative Analysis of Wallingford and the Carfree Reference District [PDF! and 5 MB download] by Robert S. Matthews. This is, so far as I am aware, the first quantitative comparison of the Reference District, as presented in Carfree Cities, with an existing urban neighborhood. Even I was surprised by how favorably the Reference District compares to what is regarded as an excellent urban neighborhood in Seattle. The next issue of Carfree Times is expected in September 2007.